6 December 2013 If you mull over the changing fortunes of German football during the past two decades, sooner or later it strikes you how closely the rise and fall and rise of the national team and Borussia Dortmund mirror each other. In this extract from Tor! The Story of German Football, Uli Hesse documents how the counter pressing tactic adopted by Jürgen Klopp at Dortmund has helped Joachim Löw's national team. Both sides won a major European title (their last to date) within 12 months of each other in the second half of the 1990s. Then they reached – and lost – finals in 2002 and 2008, both times on the back of largely middling performances, before suddenly taking off and capturing the public's imagination in 2010. Not to forget that both went through arguably their biggest ever crises in late 2004, early 2005. This correlation isn't surprising. Through large parts of the 1990s, Dortmund were desperately trying to become what the Bundesliga had until then failed to produce: a strong, perennial rival of Bayern Munich. The problem was that the only concept of how to go about this seemed to be to out-Bayern Bayern. In a mixture of desperation and megalomania, Dortmund spent ridiculous amounts of money, epitomised by the fact that they are still the only German club listed on the stock exchange, together with chemical companies, internet startups and soft drink producers. The house of cards collapsed during 2003-04, when the club admitted to having accumulated debts totalling £100m. Only a few weeks after Rudi Völler had stepped down as national coach and plunged the Germany team into a deep crisis, Dortmund's president was forced to resign and it became apparent that survival was at stake. The deciding day was 14 March 2005. On that Monday, 444 small investors came together in a building at Düsseldorf airport to listen to a Dortmund representative. These men and women had loaned the club money through an investment fund. Now they were being told that Dortmund could no longer meet the instalment agreement because there was no money left. Finally, they were asked to agree to a deferring of these payments. If they voted no, they were informed, Borussia Dortmund would be bankrupt with immediate effect. After more than six hours of questions and explanations, the investors agreed to the bailout plan the club had drawn up. At 3.30pm – the time when most Bundesliga games kick off on a Saturday – the club was saved. But that was only the beginning. Now Dortmund were forced to radically change their approach, something Bayern Munich never had to do in recent history. In so doing, Borussia followed a model similar to that of the national team. Partly out of necessity, partly through conviction, the club decided to trust young, cheap or even homegrown players who would hopefully offset their lack of experience with passion and enthusiasm. But it wasn't easy; it took time and courage. 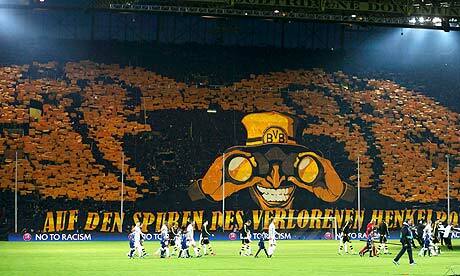 In 2008, for instance, Dortmund surprisingly reached the cup final against Bayern Munich. There was a talented centre-back in the squad, 19-year-old Mats Hummels. But coach Thomas Doll put him on the bench and played Christian Wörns (35) and Robert Kovac (34) at the heart of the defence. Two Luca Toni goals won the game for Bayern. It might have been the moment when Dortmund's board realised you can't forge new paths with an old type of coach. Five weeks after the cup final and five weeks before Germany reached the Euro 2008 final, Dortmund announced they would replace Doll with Jürgen Klopp. The revolution in Dortmund was greatly abetted by the fact that two Talent Promotion Programmes created by the German federation in 2002 had begun to yield spectacular results. Germany had won nothing in youth football since 1992 (when the Under-16s beat Spain in the European Championship final). But in mid-2009, the country became the first to simultaneously hold the three major continental titles at the junior level. The Under-17s (built around attacking midfielder Mario Götze), the Under-19s and an Under-21 side that included Hummels, Mesut Özil and goalkeeper Manuel Neuer all won the European Championship. Suddenly there were almost more excellent young players than you knew what to do with. And coaches were no longer afraid of placing trust in them. In early 2011, Dortmund would play – and win – a crucial game at Bayern with a team that had an average age of 22.3 years. In the same season, no fewer than four Bundesliga clubs (Mönchengladbach, Kaiserslautern, Freiburg and Hannover) that were either expecting to fight relegation or actually doing so decided to try youngsters in the one position where conventional wisdom says you need experience: in goal. The keepers in question were Marc-André ter Stegen (19), Kevin Trapp (20), Oliver Baumann (20) and Ron-Robert Zieler (22). They all came through. During the 10 years that followed the launch of the Extended Talent Promotion Programme, the average age of a Bundesliga footballer sunk from 27.6 to 25.3 years. It wasn't just that the young players were better schooled than previous generations – the game had become so much more demanding that young legs had an edge. They ran more and needed less rest time. In October 2010, national coach Joachim Löw said: "Our team at the World Cup was four and a half years younger than our team at the Euros and you could see that we were physically able to play at a higher pace than two years ago." He was referring to the 2008 Euros and the 2010 World Cup. And he was right. Although Germany came second in the former tournament and only third in the latter, the World Cup was much more impressive and the real eye-opener for the rest of the football world. There were some misgivings in the build-up to the World Cup, because Löw first lost his preferred goalkeeper, Leverkusen's René Adler, and then his captain and most important player, Michael Ballack, to injury. But Neuer was a more than capable replacement for Adler, and Philip Lahm, who was now widely hailed as Germany's most consistently outstanding player, took over both the captain's armband and the leadership role. Finally, none of the kids Löw tried out seemed in any way awed by the occasion or suffering from nerves. Barely three months after his first international, Bayern's 21-year-old midfielder Thomas Müller tore through the best defences in the world with fearless abandon, often to collect another fine through ball from Özil. But the German youth movement was stopped in the semi-final and by the same team that had beaten them in the Euro 2008 final, Spain. Löw's players were never able to initiate one of the breathtakingly swift attacks that had overwhelmed England and Argentina, simply because they only rarely had the ball. And if they finally won possession, often near their own penalty area, all they saw was a sea of red shirts quickly shutting off the passing lanes and closing in on them. It was a style of play Germans had begun to refer to as "counter pressing". It basically meant that if a player lost the ball far upfield, his team-mates did not retreat or swarm out in anticipation of a counter-attack. Instead they moved further forward to immediately put pressure on the opposing player with the ball. It was highly effective tactic, because the man in possession was often forced to rush his pass and if it was intercepted, it happened in a dangerous area of the pitch. But it was also a tactic that demanded an awful lot of running – not to mention a lot of practice – from the players.